John Napier was a Scottish mathematician and astronomer, best known for the invention of logarithms. He was born into the Scottish nobility in 1550; his father was Sir Archibald Napier of Merchiston Castle, and his mother, Janet Bothwell, was the daughter of a member of Parliament. Sir Archibald was only 16 years old when John was born. Napier did not attend school until the age of 13, after which he travelled around in Europe, acquiring his education at different places. He returned home in 1571 at the age of 21 and the following year he married Elizabeth Stirling, daughter of a Scottish mathematician James Stirling. Elizabeth died after giving birth to two children, after which Napier married Agnes Chisholm, with whom he had ten children. Napier had a variety of interests such as religion, mathematics, astronomy and physics. By profession he was a land owner but since he was part of the nobility, he never really had to earn a living. He was, however, a devoted landowner and made various improvements through his inventions for which he popularly came to be known as “Marvellous Merchiston”. Amongst these improvements were the use of fertilizer to improve plant growth, machinery specially designed to remove water from flooded coal pits, and mechanisms to help survey and measure land. He also envisioned several military devices, albeit only on paper. These included rudimentary versions of submarines, machine guns, and army tanks. Napier never attempted to construct these or have them commissioned to be built, but it shows that he was a visionary and a thinker ahead of his time. Napier was very much interested in astronomy and often undertook research involving lengthy manual calculations. It was this that led to the development of logarithms. Napier decided that it would be much simpler to express large numbers as powers of smaller numbers and then do the calculations involving smaller numbers which would then become much easier to do. This was first publicized in his book published in 1614 called “A Description of the Wonderful Canon of Logarithms”. It included not only a description and explanation of the nature and use of logarithms but also a set of logarithmic tables to use for calculations. Napier’s principles were so impressive that many scientists and astronomers adapted them in their calculations. An English scientist named Henry Briggs personally came to meet Napier and together the two began a collaborative endeavor towards improving these tables. Napier’s other contributions to mathematics included improvement and enhancement of the decimal point system introduced by Simon Stevin. Although these were already in existence, Napier played a great part in popularizing their use. He also developed a tool for quick and convenient multiplication, called “Napier’s Bones”. This was a manually operated calculating device, based on the lattice multiplication method originally developed by Arab Muslim mathematicians. Napier was also deeply interested in theology and was a strong believer of the Protestant faith. Scotland at that time was immersed in a religious and civil war between Catholics and Protestants. Napier was decidedly anti Catholic and freely expressed his views in his book “A Plaine Discovery of the Whole Revelation of St. John” published in 1593. Here he claimed that the Catholic Church and the Pope were the root of all evil. He even predicted the Apocalypse which would be brought about by the misdeeds of unbelievers such as Catholics and atheists. 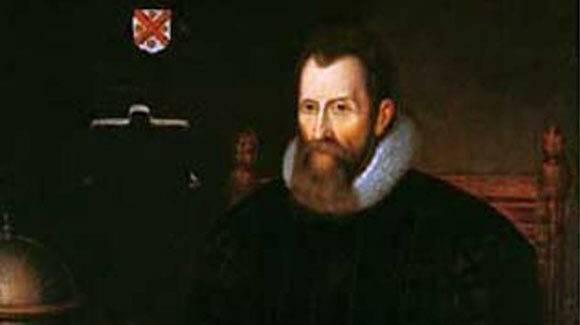 John Napier was actively involved in politics till the end of his life and died in 1617 at the age of 67.